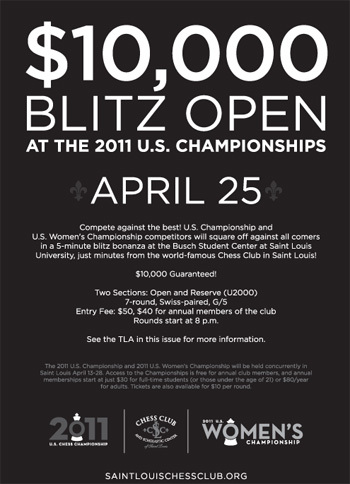 The 10K Blitz at the US Championships is back, with $10,000 in guaranteed prize money at stake on April 25th in Saint Louis. This grand blitz event coincides with the 2011 US Chess Championship (April 13-28). See more details on the US Chess Championship on the Chess Club and Scholastic Center of Saint Louis website, including pairings for the Saint Louis Invitational qualifier event (March 4-9). Tournament flyer and TLA details below. Come to watch and play! Play against the best at the 2011 U.S. Championship Blitz Open. This open Blitz tourney will attract U.S. Championship competitors and players from across the country for over $10,000 GTD. 7SS, G/5. Saint Louis University, Busch Student Center, #20 North Grand, St. Louis Room, #300, Saint Louis, MO 63103 Free entries for GMs and competitors of the U.S. Championship and U.S. Women’s Championship. EF: $50, $40 for annual members of the club. MCA Membership Req'd from $5. OSA. QUICK USCF ratings will be used for pairing and prizes. Games will be quick rated. Two Sections: Open & Reserve (U2000) PF: $10,050 Open: 1st-5th: $2000 - 1300 - 800 - 500 - 300, Top Woman: $400 - $250 - $200, U2400: $300 - 200 - 100, U2200: $275 - 195 - 90, Upset Prize-$100, *Total: $7010 *Reserve (U2000) 1-5th: $750 -500 - 400 - 300 - 200, U1800: $250 - 150, U1600: $200 - 125, U1400/Unrated: $100 - $65, *Total: $3040*. Reg. : 6:30-7:45 p.m. Rounds start at 8 p.m. Hotel (ask for chess rate): Chase Park Plaza Hotel, 1-877-587-2427, $159/night. Indigo Hotel, 314-361-4900, $99/night or $109/night (2 doubles). Parkway Hotel, 314-256-7777, $97/night. Water Tower Inn, 314-977-7500, $70/night. Ent: Pre-register at 4657 Maryland Ave., Saint Louis, MO 63108, or online at saintlouischessclub.org, until 6:30 p.m. day of event. On-site registration at Busch Student Center 6:30-7:45 p.m. Complimentary parking at the South West corner of Grand and Laclede. Info: 314-361-CHESS or [email protected] WCL JGP.